QB Kirk Cousins $6,000 @ PHI – For the second straight season, the Eagles defensive front has been so good that opposing offenses are completely abandoning the run. Philly ranks 31st in DVOA pass defense against opposing No. 2 WR s thanks to ineffective play from CB Jalen Mills. The Vikings had two elite receivers in Adam Thielen and Stefon Diggs, who are both capable of torching Mills should the coaching staff look to exploit that matchup. Kirk Cousins has been lighting it up with those two weapons on the outside. He’s completed a league-high 131 passes on a league-high 189 attempts (69.3% completion rate) and is posting the highest passer rating (103.6) of his career. With Carson Wentz likely to keep pace on the other side, this game has the makings of another shootout. QB Joe Flacco $5,400 @ CLE – In recent seasons, the Browns have been smashed by opposing ground attacks due to negative game flow. Yet with Baker Mayfield captaining an improving offense, Cleveland is facing the fifth-most pass attempts per game (41.2) and giving up the ninth-most passing YPG (278.2) this season. Joe Flacco has produced 21-plus DK points in three of his four starts this season thanks in no small part to an improved receiving corps. With promising rookie TE Haydon Hurst expected to make his debut, he should have even more options this Sunday. Cleveland will be without No. 2 CB Terrance Mitchell (arm), opening up the side of the field opposite first-round pick Denzel Ward. Look for Flacco and Michael Crabtree or John Brown to work Mitchell’s replacement, a 2014 sixth-rounder named E.J. Gaines. RB Phillip Lindsay $4,800 @ NYJ – Along with power back Royce Freeman, Phillip Lindsay flashed a ton of promise while nearly leading the Broncos to a win over the Chiefs on Monday night. The 5-foot-9, 190-pound Colorado product may have gone undrafted, but he’s playing like a true three-down back with a chip on his shoulder due to his perceived lack of size. Lindsay out-touched Freeman 14-8 and played on 40 percent of offensive snaps in Week 4. He’s the superior receiving back and should see work in that capacity against a Jets team that’s tough to run against up the middle. 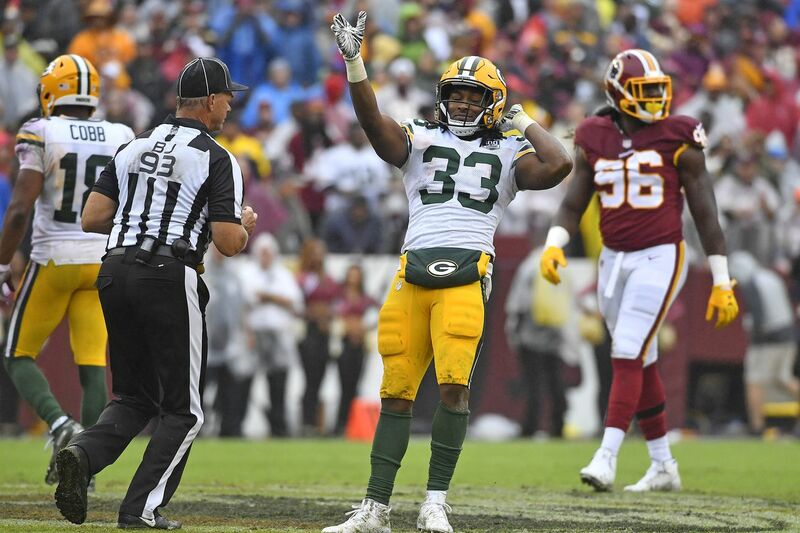 RB Aaron Jones $4,300 @ DET – The Packers have three backs they can potentially use, including Jamaal Williams and Ty Montgomery. Yet Williams is a plodder and Montgomery is a converted WR, who isn’t necessarily capable of pounding out runs between the tackles or carrying on the goal line. Aaron Jones can do it all, and he’s cementing his status as the Packers lead back by averaging 5.7 YPC on 17 totes through two appearances. He played on 38 percent of offensive snaps in Week 4 and Aaron Rodgers has openly stated that Jones needs to be more involved in the offense. This is a great spot for him to feed the young RB against a Lions team that ranks 27th in DVOA rush defense. WR Keelan Cole $4,900 @ KC – He’s been very quiet since blowing up for 116 yards and a TD against the Patriots, but this could be the week Keelan Cole flashes his upside again. Dede Westbrook carried the Jags passing offense in a tough matchup against the Jets last week, but both him, Cole, and Donte Moncrief should have productive days against a Chiefs team that ranks 30th in DVOA pass defense and faces the most pass attempts per game (43.5) this season. Leonard Fournette’s likely absence will force Jacksonville into more of a pass-heavy approach on the road and Cole should have some opportunities to make plays against 31-year-old CB Orlando Scandrick. WR Tyler Lockett $4,600 vs. LAR – The return of Doug Baldwin (knee) seems to have led to a price decrease for Tyler Lockett and it will almost certainly lower his ownership rate in Week 5. Yet the speedster played on the most snaps (62) of any receiver last Sunday and caught 5-of-6 targets for 53 yards despite a run-heavy approach. The Seahawks will likely be forced to throw more often with the high-powered Rams offense coming to town this week, and the Rams have been surprisingly vulnerable over the middle of the field. With Aqib Talib (ankle) out and Marcus Peters (calf) banged up, the Rams have been forced to use slot CB Nickel Robey-Coleman on the outside at times. Lockett lines up all over the field and developed into a preferred red zone option for Russell Wilson when Baldwin was out. Now that Baldwin is back to draw coverage away from Lockett, he could continue to make an impact in a potentially high-scoring affair. TE Jared Cook $4,800 @ LAC – Jared Cook only sees a modest price increase despite going off for 110 yards and 2 TDs while drawing a team-high 13 targets last week. He’s become a clear-cut favorite in Jon Gruden’s new scheme and could fly under the radar a bit this week because the Chargers have been good against TEs this season. Yet the home team will be without excellent WLB Kyzir White, who played on 73 percent of defensive snaps and served as their primary coverage man against TEs this season. Overall, the Chargers rank 23rd in DVOA defense and have been pummeled by opposing WRs. Gruden often moves Cook around the formation so that the 6-foot-5 speedster can create mismatches on the outside. FLEX Corey Grant $3,700 @ KC – With Leonard Fournette (hamstring) doubtful this week, T.J. Yeldon will be a popular play. But Yeldon is a bit banged up himself and we’ve seen the Jaguars use a committee involving Corey Grant when Fournette was out against the Patriots in Week 2. The Chiefs represent an even greater challenge with the MVP of the first quarter of the season (Pat Mahomes) leading the best offense in the AFC. That prolific offense combined with a horrid defense has led to KC giving up the most receiving yards (385) and most DraftKings points (154.6) to opposing RBs this season. Grant has flashed great ability to run after the catch and should be a safety valve for Blake Bortles all afternoon. D/ST CIN $2,700 vs. MIA – The Bengals get one of the best LBs in football back this week in Vontaze Burfict. His presence should make a huge difference for a team that coughed up 67 points over two road games the past two weeks. Without Burfict, that unit has managed 10 sacks this season, four of which came at home along with three turnovers in a Week 2 win over the Ravens. Carlos Dunlap and Geno Atkins will have the crowd behind them this week against a Dolphins team that rarely passes, yet ranks 25th in rushing YPG (88) and just lost starting center Daniel Kilgore (triceps) for the season.